Do you need increased sensitivity and specificity from your RNA-seq experiments? Do you have ever-decreasing amounts of input RNA? To address these challenges, our next generation of RNA library prep kits have been reformulated at each step, resulting in several fold higher yields of high quality libraries, enabling use of lower input amounts and fewer PCR cycles. Our new NEBNext Ultra II RNA kits have streamlined, automatable workflows and are available for directional (strand-specific, using the “dUTP method”) and non-directional library prep, with the option of SPRIselect® beads for size-selection and clean-up steps. Why consider the NEBNext Ultra II (Directional) RNA Library Prep Kit for Illumina? 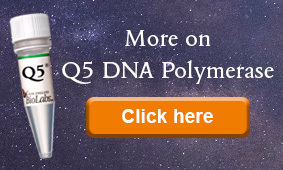 Poly(A)-containing mRNA was isolated from 10 ng, 100 ng and 1 µg of Universal Human Reference RNA (Agilent #740000) and libraries were made using the NEBNext Ultra II Directional RNA kit, Kapa Stranded mRNA-Seq kit, Kapa mRNA HyperPrep kit and Illumina TruSeq Stranded mRNA Kit. The input RNA amount and number of PCR cycles are indicated. Library yields from an average of three replicates are shown. Error bars indicate standard deviation. Library yields were assessed using the Agilent® Bioanalyzer®. This content is covered by patents, trademarks and/or copyrights owned or controlled by New England Biolabs, Inc. For more information, please email us at gbd@neb.com. The use of these products may require you to obtain additional third party intellectual property rights for certain applications. ILLUMINA® and TRUSEQ® are registered trademarks of Illumina, Inc.